This model was developed as part of an Action Learning Set for reablement services across Wales that involved nine Authorities and therefore saw an ithink model embedded within a wider toolkit supporting networked learning. 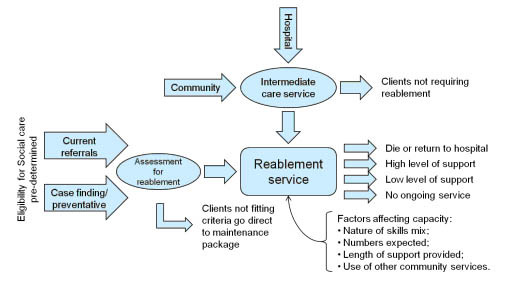 The model considers the impact of an optimised reablement service for a given local population and therefore provides an opportunity for reviewing local reablement services (in terms of both capacity and service model) in the context of the whole system. The model was built using ithink software following a review of national evidence and local experience in implementing reablement services. The Action Learning Set of which the project was a part convened a working group that met on three occasions to define the key issues and develop the model framework with the assistance of the consultants. The National Assembly for Wales had identified reablement services as a priority and had therefore asked the Social Services Improvement Agency to support Local Authorities in developing these services. The work continues to be promoted through the SSIA website as a key tool in reablement implementation across Wales. After making the tool available on the SSIA website Authorities have been encouraged to adopt the workbook and modelling approach to refine their plans for the development and enhancement of reablement services. A full report on the Reablement Framework Modelling Tool is available on request from Peter Lacey .